alaTest a collecté et analysé 438 avis de consommateurs et d'experts pour le produit Skullcandy Method. La note moyenne du produit est 4.1 sur 5, tandis que les autres Casques Audio ont une note moyenne de 4.2 sur 5. Les auteurs d'avis apprécient l'ergonomie. Le comfort d'utilisation impressionne, mais de nombreux avis sont moins positifs sur la fiabilité. Après analyse des notes de consommateurs et d'experts, de l'âge du produit ainsi que d'autres facteurs, et comparé aux autres Casques Audio, le Skullcandy Method obtient un alaScore™ de 89/100 = Très Bien. Some of the best wireless headphones you’ll find at the price. 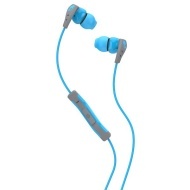 The reasonably priced Skullcandy Method Wireless earphones delivers solid Bluetooth audio from an exercise-friendly, neckband-style frame. Powerful audio performance with robust bass response. Comfortable, secure fit. Sweat-resistant design intended for workouts. Affordable. Less crisp in the high-mids than some users will prefer. Light on accessories. Powerful audio performance with heavily boosted bass, and sculpted high-mids and highs. Inexpensive. Secure fit and design ideal for exercise. Inline remote control and microphone for mobile devices. Intense, boosted bass not for anyone looking for accurate, flat response. The Skullcandy Method In-Ear Sport headphones are cheap buds with secure inserts and big bass, but overall their audio quality lacks clarity and definition. "The neck strap is handy for use whilst doing sport. I've been getting around 10 hours of battery life so far and the sound quality is much better than my previous earphones. Good value for the cost I think "
Bluetooth range measured in CM / inches.